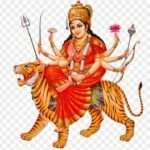 Sharanu Sharanu Jagadambike Lyrics | Navaratri Songs: Sharanu Sharanu Jagadambike is a Kannada devotional song composed by Mohanraj and the lyrics was written by Gooturi for the Kannada devotional album Navaratri Banthu. Aananda Audio Video is the record label of this album. Sharanu Sharanu Jagadambike song was rendered by singers Kasthuri Shankar and Indu Vishwanath.